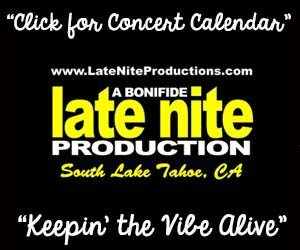 Jazz Johnson, who scored all 12 of his points in the second half, drives during Nevada’s 86-70 win Tuesday over BYU in the season basketball opener in Reno. Jordan Caroline is a force to be reckoned with. 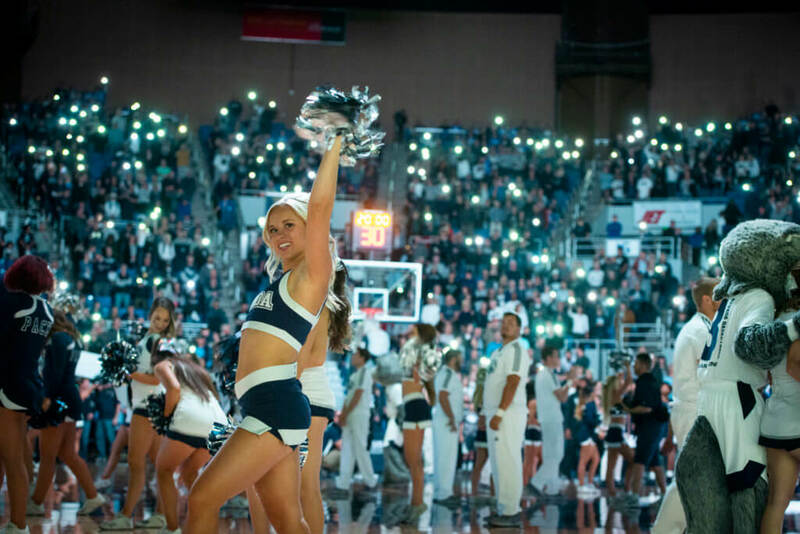 The seventh-ranked Nevada Wolf basketball team opened its season against BYU at a roaring Lawlor Events Center on election night. When all the votes were tallied, the home team prevailed 86-70 in a relative landslide, thanks to Caroline’s first-half effort. Caleb Martin picked up his second foul 3 minutes, 15 seconds into the game, and brother Cody did likewise shortly thereafter. 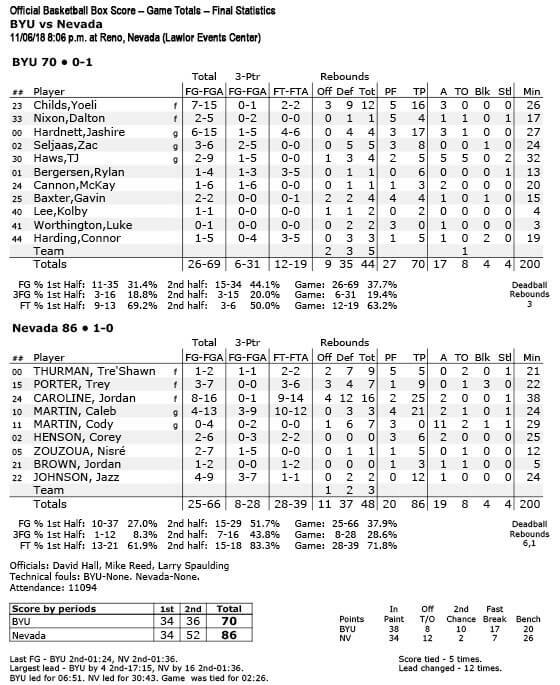 With both stars on the bench, having contributed zero points in the first half for the first time in their careers, coach Eric Musselman spent the rest of the half rotating players around Caroline with at least five different lineups. Jordan Caroline draws a crowd in the paint. 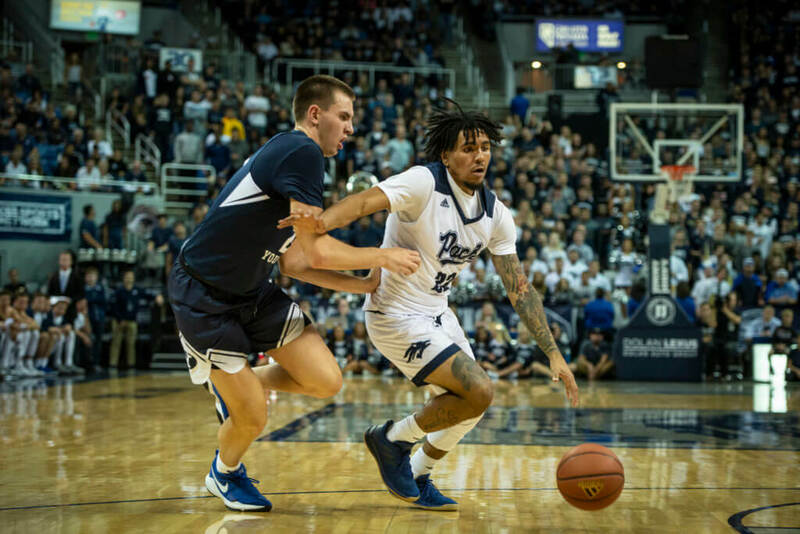 Caroline, coming off of an ankle injury that kept him out of practice for 10 days, led Nevada in the first half with 13 points and 14 rebounds. He had 25 and 16 in the game. He played 38 minutes. “Unless I had a cast on, I was going to play,” Caroline said. Nevada shot 27 percent from the field and 1-12 from three-point land in the first half. The game was tied at 34 at intermission. 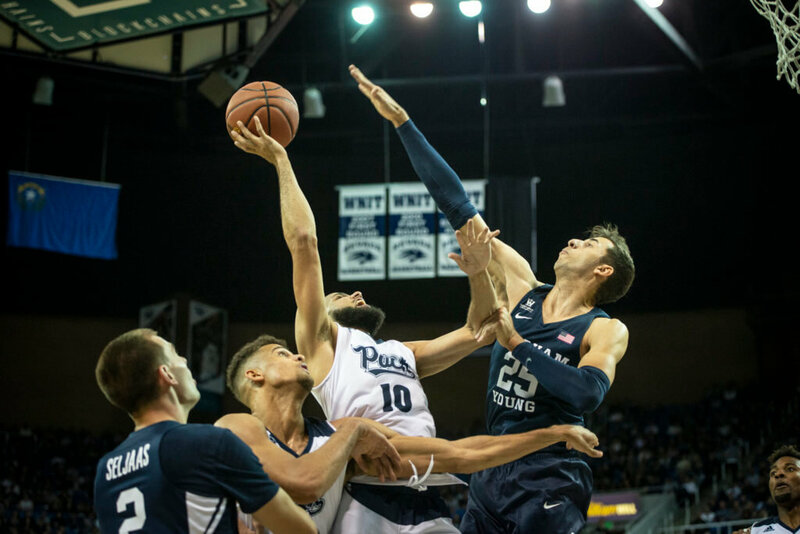 With Nevada’s starting five back on the court, it established rhythm at both ends of the floor. It helped that BYU forward Yoeli Childs (16 points, 12 rebounds) picked up two quick fouls and headed to the bench with his fourth of the game just a minute into the second half. 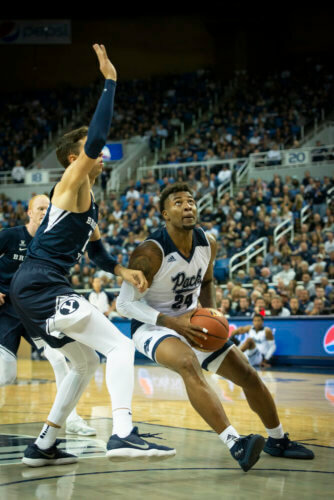 Still, BYU hung tough until Musselman decided to go small, inserting a rotation of transfer guards Nisre’ Zouzousa, Corey Henson and Jazz Johnson around the Martin twins and Caroline, who spotted up at the high post. The smaller lineup helped the Wolf Pack to beat BYU’s zone, leading to open shots. “The smaller lineup allowed us to zing it around a little bit, and we were really effective against their zone,” Caleb Martin said. One of the beneficiaries was Johnson, who after going 0-4 in the first half, was 3-4 from three-point distance, finishing with 12 points. The final 10 minutes saw Caleb Martin, an AP preseason All-American, turn it on offensively with three pointers and driving the rim, adding 21 points in the second half. Made baskets allowed Nevada to set its defense after struggling against BYU’s zone in the first half. Jashire Hardnett scored a team-high 17 points for BYU. Notes: Tre’shawn Thurman started the game and had nine rebounds and five points before fouling out. … Head Coach Eric Musselman credited Thurman with his defensive play being the key to getting Yoeli Childs in foul trouble. … It was the 16th largest crowd in school history, 11,094. … Musselman improved 22-0 in home non-conference games. … Nevada is now 26-2 when Caroline (25 points, 16, rebounds) has a double-double. His 16 rebounds ties his career high. Cody Martin tied his career high 11 assists. … Nevada started five seniors: The Martins, Caroline, Porter and Thurman. 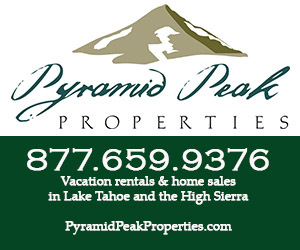 … Porter had nine points and seven rebounds. The 16th largest crowd in school history witnessed an opening night victory. Preseason All-American Caleb Martin scored all 21 of his points in the second half.